We are delighted to host Professor Alex Maritz as our guest speaker at Insight Academy. Alex is a globally awarded and distinguished entrepreneurship educator and mentor and is a Professor of Entrepreneurship at La Trobe University. As an accomplished corporate entrepreneur, he has significant experience in launching globally successful disruptive technologies in the entertainment industry. He is Australia’s leading expert in entrepreneurship education, coupled with pioneering research in senior entrepreneurship. 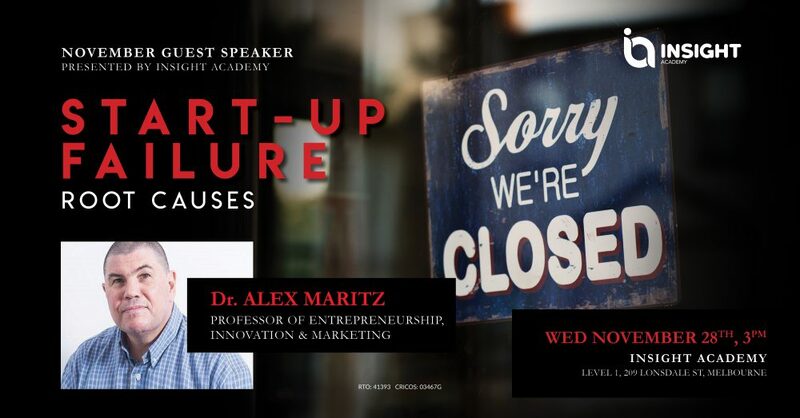 Having just returned from the Global Consortium of Entrepreneurship Centres in Chicago (2018 GCEC), Alex will share the latest research and practice regarding root causes of Start-up Failure. Join us for an interactive and thought to provoke presentation at 3.00pm on Wednesday 28 November 2018.